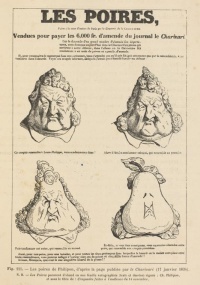 Designs by French artist Charles Le Brun, from Méthode pour apprendre à dessiner les passions (1698), a book about the physiognomy of the 'passions'. A caricature is a pictorial representation of someone in which distinguishing features are exaggerated for comic effect or a grotesque misrepresentation. It can take the form of either a portrait that exaggerates or distorts the essence of a person or thing to create an easily identifiable visual likeness, or in literature, a description of a person using exaggeration of some characteristics and oversimplification of others. The term is derived from the Italian caricare- to charge or load. An early definition occurs in the English doctor Sir Thomas Browne's Christian Morals (first pub.1716). Expose not thy self by four-footed manners unto monstrous draughts, and Caricatura representations. A tendency to burlesque and caricature appears, indeed, to be a feeling deeply implanted in human nature, and it is one of the earliest talents displayed by people in a rude state of society. An appreciation of, and sensitiveness to, ridicule, and a love of that which is humorous, are found even among savages, and enter largely into their relations with their fellow men. When, before people cultivated either literature or art, the chieftain sat in his rude hall surrounded by his warriors, they amused themfelves by turning their enemies and opponents into mockery, by laughing at their weaknesses, joking on their defects, whether physical or mental, and giving them nicknames in accordance therewith, in fact, caricaturing them in words, or by telling stories which were calculated to excite laughter. When the agricultural slaves (for the tillers of the land were then slaves) were indulged with a day of relief from their labours, they spent it in unrestrained mirth. And when these same people began to erect permanent buildings, and to ornament them, the favourite subjects of their ornamentation were such as presented ludicrous ideas. The warrior, too, who caricatured his enemy in his speeches over the festive board, soon fought to give a more permanent form to his ridicule, which he endeavoured to do by rude delineations on the bare rock, or on any other convenient surface which presented itself to his hand. 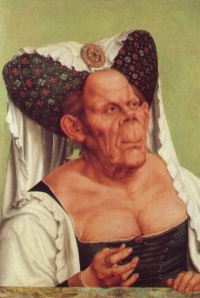 Thus originated caricature and the grotesque in art. In fact, art itself, in its earliest forms, is caricature for it is only by that exaggeration of features which belongs to caricature, that unskilful draughtsmen could make themselves understood. 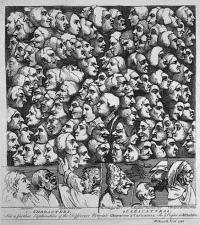 Early anonymous examples of caricature are Roman caricatures. 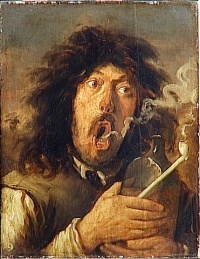 Caricatures were plentiful in the Middle Ages. 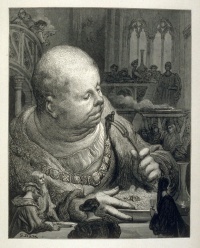 See The Grotesque in Church Art and Champfleury's Histoire de la caricature au moyen âge et sous la renaissance (1870). Both mention Bernard's diatribe against grotesque church art "Quid facit illa ridicula monstruositas." Some of the earliest non-anonymous caricatures are found in the works of Leonardo da Vinci (1452 – 1519), whose caricatures and grotesques depicted people with deformities. Especially virulent political caricatures arose in Germany at the time of the reformation. Examples include Abbildung des Papsttums (1545) by Lucas Cranach the Elder, illustrating one of Martin Luther's anti-Semitic and antipapal pamphlets. Gian Lorenzo Bernini (1598-1680), one of the great early practitioners, was favored by the members of the papal court for his ability to depict the essence of a person in 'three or four strokes' as is clear from the doodle Caricature of Innocent XI. In France, there was the work of Jacques Callot (c. 1592 - 1635). The first book on caricature drawing to be published in England was Mary Darly's A Book of Caricaturas (c. 1762). 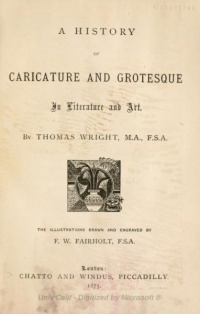 The three great practitioners of the art of caricature in 18th-century Britain were William Hogarth (1697 – 1764), Thomas Rowlandson (1756–1827) and James Gillray (1757–1815). Rowlandson was more of an artist and his work took its inspiration mostly from the public at large. Gillray was more concerned with the vicious visual satirisation of political life. They were, however, great friends and caroused together in the pubs of London. The 18th century was also the age of physiognomy. George Cruikshank (1792-1878, British) created political prints that attacked the royal family and leading politicians (in 1820 he received a royal bribe of £100 for a pledge "not to caricature His Majesty (George III of the United Kingdom) in any immoral situation." He went on to create social caricatures of British life for popular publications such as The Comic Almanack (1835-1853) and Omnibus (1842). He also earned fame as a book illustrator for Charles Dickens and many other authors. 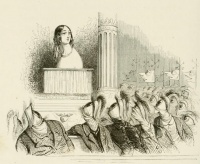 Also of note during 19th century France, was the work of Grandville (1803 – 1847). Thomas Nast (1840-1902, American) was a famous caricaturist and editorial cartoonist in the 19th century and is considered by some to be the father of American political cartooning. He is often credited with creating the definitive caricatures of the Democratic Donkey, the Republican Elephant and Santa Claus. Nowadays, caricature artists are popular attractions at many places frequented by tourists, especially oceanfront boardwalks, where vacationers can have a humorous caricature sketched in a few minutes for a small fee. Caricature artists can be hired out for parties, where they will draw caricatures of the guests for their entertainment. That caricature did not lose its power of controversy is proved by the Jyllands-Posten Muhammad cartoons controversy of 2005. Unless indicated otherwise, the text in this article is either based on Wikipedia article "Caricature" or another language Wikipedia page thereof used under the terms of the GNU Free Documentation License; or on original research by Jahsonic and friends. See Art and Popular Culture's copyright notice. This page was last modified 21:35, 9 March 2017. This page has been accessed 28,491 times.